Rescue boat searching the Tallapoosa River Friday. A Wetumpka man has died after being swept underwater in the Tallapoosa River in Tallassee near the AES boat ramp on Thursday afternoon. John Picken, age 27, was fishing with friends when electricity began being generated and water levels quickly rose. Picken's brother and two friends were able to make their way up the banks to safety, while he was reeling in a fish. 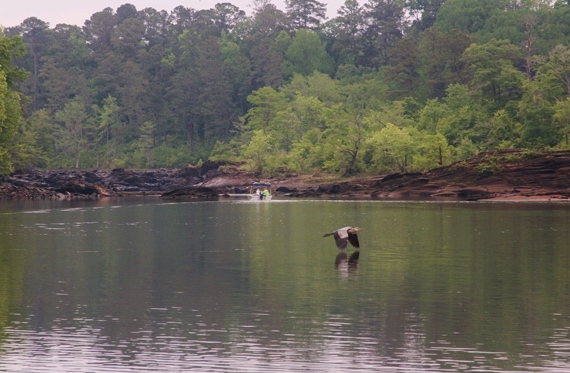 The Alabama Power Company cooperated with search teams by lowering levels below Thurlow Dam. Picken's body was found on Saturday morning. Tallassee police chief Jimmy Rodgers said that the four men did not hear the sirens which go off when water is generated, but noticed the rising water. "People don't realize how quickly that water comes," Rodgers stated. "Mr. Picken apparently slipped on the rock from the pressure of the water coming down the river. He was last seen at the eddy." Picken Rodgers said studies have been done that indicate water levels rise three feet in just over a minute when electric current is being generated. Alabama Power has a toll-free number (800-525-3711) for access to information on generation schedules of their hydroelectric facilities. Tallassee resident Keith Chambers, who leases property on the Tallapoosa River, uses the service. "I call before I go down there to make sure the water's not on and not going to be on." 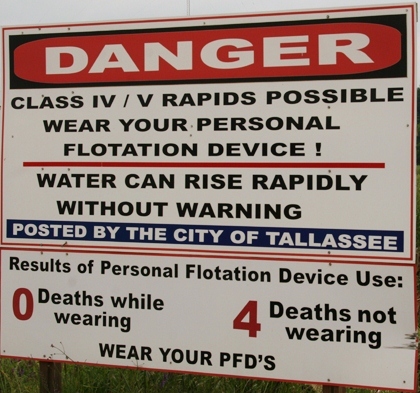 Alabama Power and the city of Tallassee have signage that lists the hazards of the waterway. Rodgers emphasized the importance of personal flotation devices. "Your likelihood of surviving with a life preserver is much greater than without one," he said. "For whatever reason, people feel more comfortable in their own strengths and abilities. We were down there Saturday afternoon finishing up and there were several groups that came down there, none of which had any kind of life preservers." The last fatality on the river in Tallassee was exactly four years ago. 22-year-old Auburn University student, Walker Taylor, died in a kayaking accident near where Picken drowned.